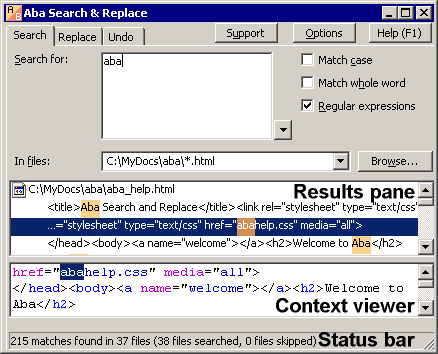 The main window is divided into Search, Replace, and Undo tabs. On the Search tab, you can view the found phrase in context: the lower pane shows you the lines where the phrase was found. On the Replace tab, you can preview the result of replacement. The left column lists the occurrences found in your files; the right column shows the same lines after replacement. The Undo tab allows you to revert your files to the previous state after replacement.